When change occurs in business it is not always easy to find innovative and versatile solutions to what may be a list of exacting and conflicting requirements. 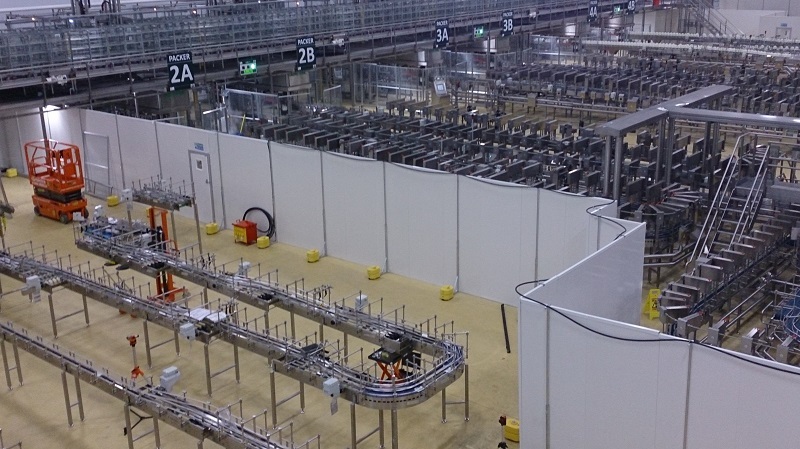 Arla Foods in Aylesbury were needing to install a new production line, but needed to ensure that current production would not be compromised in any way. It was clear that an effective means of segregating the existing lines from the new area was needed. Installation of the system could not disrupt working production. The solution should allow installers to move freely between the work area and outside, without coming into contact with the food production areas. The system should be capable of being easily dismantled and reused, in other locations across the UK. The system should be able to be reconfigured as work progressed, and to allow for adjustable access for the delivery of new equipment. Westgate recommended their Hoardfast® PVC modular partitioning system. As this system features a click together joint it is quick to install, and does not create any dust or mess. This was a perfect solution to the problem, and ensured that the installation could work in conjunction with current production, thus maximising Arla Foods’ up-time. (Hoardfast® can be broken down and relocated during phased or multi location works too). The design and build of the Hoardfast® system provides a dust tight seal, and was used to create a sealed walk way between the installation and outside areas. Based on calculations, being able to segregate these two areas with a designated walkway has already saved the company enough money to cover the initial purchase cost of the hoarding system.